To catch evil, it takes evil. Enter Devyl Bane—an ancient dark warlord returned to the human realm as one of the most notorious pirates in the New World. A man of many secrets, Bane makes a pact with Thorn—an immortal charged with securing the worst creations the ancient gods ever released into our world. Those powers have been imprisoned for eons behind enchanted gates . . . gates that are beginning to buckle. At Thorn’s behest, Bane takes command of a crew of Deadmen and, together, they are humanity’s last hope to restore the gates and return the damned to their hell realms. But things are never so simple. And one of Bane’s biggest problems is the ship they sail upon. For the Sea Witch isn’t just a vessel, she’s also a woman born of an ancient people he wronged and who in turn wronged him during a centuries long war between their two races—a woman who is also sister to their primary target. Now Marcelina, the Sea Witch, must choose. Either she remains loyal to her evil sister and almost extinct race against Bane and his cause, and watches humanity fall, or she puts faith in an enemy who has already betrayed her. Her people over the totality of humanity—let’s hope Bane can sway her favor. 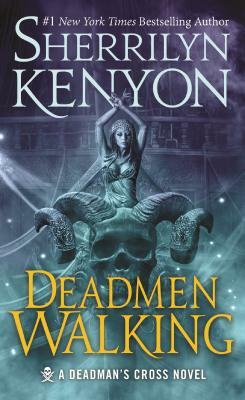 Deadmen Walking is the first historical fantasy title in New York Times bestselling author Sherrilyn Kenyon’s Deadman’s Cross series. It is a tale of passion and loss, emotions that wound and heal…and ultimate redemption. New York Times bestselling author Sherrilyn Kenyon is a regular in the #1 spot. This extraordinary bestseller continues to top every genre in which she writes, including manga and graphic novels. More than 70 million copies of her books are in print in more than one hundred countries. Her current series include The Dark-Hunters, The League, Deadman's Cross, Chronicles of Nick, Hellchasers, Mikrochasers, and The Lords of Avalon. Her Chronicles of Nick and Dark-Hunter series are soon to be major motion pictures.